If you have kept goats at home, you will also have to provide them with adequate food. What about using your goats to control brush and weed around your house, while satisfying their hunger at the same time? It seems to be a good idea and it is effective as well. You need not to remove brush and weed manually by yourself and let your goats in charge of this cleaning process instead. According to animal experts, goats have more inclination to feed on leafy portion of weeds and brush, instead of grazing on the lush grass. You can use your goats to control weeds in your garden easily. First thing you need to begin this weed and brush-removing process is to make a proper fence around your house, so that goats do not escape the premises. Particularly examine the strength of the fence near the affected areas, for you don’t want your goats to break away. A 42-inch tall, barb wire-topped wooden fence is ideal to install and contain your goats. Electric fence is the other alternative to restrain your goats from escaping the premises. Once you have enclosed the area, you just need to release all of your goats into it for grazing. It is better to use the non-milking goats for this process, as they require lesser maintenance and do not need much healthy diet. Dairy breeds of goats require proper feeding and healthy diet to produce more milk and hence, they are not suitable for the cause. 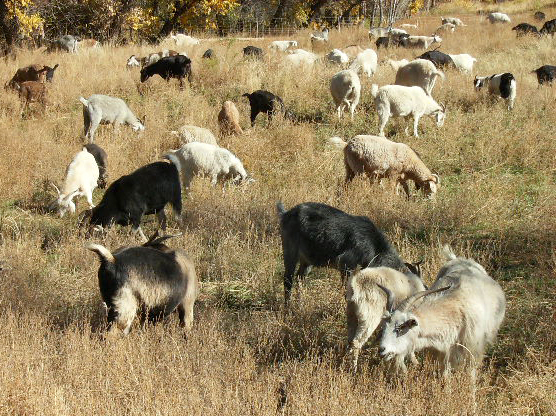 3 to 10 goats in one acre are sufficient but it all depends how quickly you want to remove weeds and brush from your premises. 3 goats can survive by eating out weed on 1 acre of land for almost a month. Water should be readily available for your goats to drink and avoid dehydration, especially in hot weather. You should also provide mineral supplements to your goats as well to keep them healthy. Specially formulated mineral powders are available in the market, which meet the nutritional needs of goats. For encouraging your goats to eat more weed, you have to limit their access to hay and grain. Keep examining your goats’ health and see if they are not getting weaker or thin. This might be the sings of weed and brush running out of your land and your goats starving for food.